When it comes to breaking down world-building and exploring lore, few games offer as much character and exposition as the wonderful world of The Legend of Zelda. Thanks to a fruitful ongoing collaboration with Nintendo, North American comics/book publisher Dark Horse Comics has been producing all manner of glossy hardcovers on the series, including many other Nintendo franchises. So can you list which books you have worked on over at Dark Horse, including all Nintendo related titles? Oof. I don’t know that I could ever give you a comprehensive list of all the books I’ve ever worked on at Dark Horse. I’ve been lucky enough to have worked on thousands of comics in my ten years at Dark Horse. There is a website that tracks that kind of thing, but I haven’t even tried. More specifically, I’ve worked on a number of video game comics from Tomb Raider to Dragon Age, among others. More recently, I’ve shifted focus from comic books to art books. 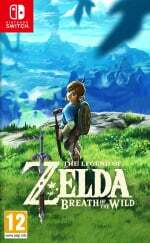 I’ve done The Legend of Zelda: Hyrule Historia, The Legend of Zelda: Art & Artifacts, The Legend of Zelda: Encyclopedia, The Legend of Zelda Breath of the Wild: Creating a Champion (upcoming), The Art of Splatoon, The Art of Fire Emblem Awakening, The Art of Mirror’s Edge: Catalyst, and Go Team Venture! : The Art and Making of the Venture Bros. (upcoming). I’m also developing a number of books that haven’t been announced yet. Nintendo and Dark Horse's collaboration is a relatively new partnership. It seems to have been an extremely successful one. Can you give us the insider story of how it all got started? A lot of it had to do with timing. I’ve been a huge Nintendo fan for my entire life and noticed that they were not doing much in the way of published materials. We had just recently had some success with video game related comics with Mass Effect, and, more importantly, art books. Samantha Robertson, a former Dark Horse editor who now works in Nintendo’s Treehouse division, had created an art book for the Art of Avatar: The Last Airbender. It was this big, beautiful 9 x 12 coffee table book of really high quality that would become the template for our whole art book line. We then did The Art of Alice: Madness Returns and had a book called The Art of the Mass Effect Universe book in the works. It was really obvious that we were on to something really fun and interesting. People really responded to these books. Calling them art books might be a bit of a misnomer because they all include behind the scenes information and development materials. They feature a lot of beautiful artwork, but they’re also 'making of' books. So in 2011, I tracked down Nintendo’s booth at San Diego Comic Con and met Seth McMahill. We exchanged cards and he put me in contact with Cammy Budd who was Nintendo’s senior third-party marketing manager. She asked me what a partnership with Nintendo might look like. I knew that the 25th anniversary of the Legend of Zelda was coming up, so I pitched her on a book that would be a retrospective look at the whole series. Initially, she told me that she wasn’t sure that they’d have the resources available to support such an endeavor, which is totally reasonable, these are incredibly time intensive to make. A month or so later, she contacted me again saying that she had talked to NCL and that they were in talks with another company, which I later learned was Shogakukan, who was developing a book very similar to that in Japan. They obviously weren’t going to do two books, but asked if we were interested in doing a localisation of that book. After bringing in Dark Horse's licensing guru Nick McWhorter, we worked out the details and were off and running. Hyrule Historia hit my desk shortly after that. How many copies of Hyrule Historia have been sold? I don’t know the exact number of how many copies Hyrule Historia has sold to date, but I believe it’s around 900,000 copies at this point. I’m interested in hearing more about your workflow. A lot of people are involved in the page layouts, so how does all this artwork cohesively get sorted onto your pages? Shogakukan and Ambit did the sorting for Hyrule Historia and the other three Zelda books respectively, so I can’t speak to their process, though I know they had heavy cooperation from the fine people at Nintendo. There were mountains of materials for Breath of the Wild, for example. But I can speak to the more general aspects of organising these books from the ground up. You do it in the way that makes the most logical sense. For video game retrospective books, I generally like to organise chronologically by release. For cartoons, I organise by season and break those down by episode. The key is to find your narrative. You want to show through the artwork and captions the whole process in a linear way. You are telling a story. For all four of the Zelda books, Cary Grazzini has been my partner in that. He’s handled the design since Hyrule Historia and he was the one that gave us that iconic green and gold cover. Yeah, let’s talk about that! Beginning with Arts & Artifacts and going into Encyclopedia, your team has come up with some gorgeous special edition versions of the titles. Where did that idea come from? Who designed those covers? This is one of my favorite topics. After the success of Hyrule Historia, Cary and I were able to play with every toy in the toy box, so to speak. Cary, our print director Vanessa Todd-Holmes, and I would sit and hash out ideas. Cary came up with the Master Sword special edition for Art & Artifacts. 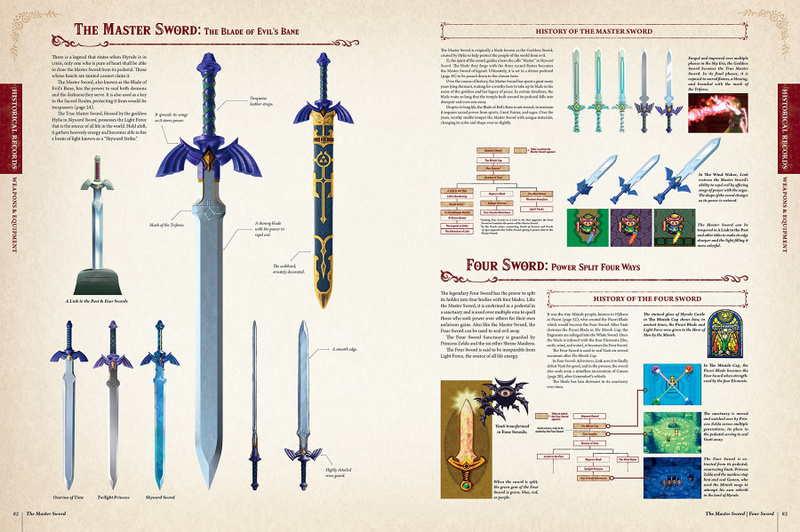 His logic was that this book heavily featured the artifacts from each of the games, and what artifact is more precious or central to the games than the Master Sword? We came up with all kinds of plans for it from trying to house it inside a pedestal to the design we eventually landed on. Vanessa suggested the 3D embossing so that it was not just raised but also shaped like a sword. We had just done another book with a clear acetate sleeve, so we knew we could print a sheath on it. Cary made sure that the sword was made to scale so that it felt like you were drawing the Master Sword yourself. That was a fun one. Initially, we had mocked up a version that was metallic gold with a red Gate of Time symbol on the front just like Hyrule Historia. That didn’t look right to me, so I decided to lean into the gold origins and out of that sprang the gold cartridge cover. 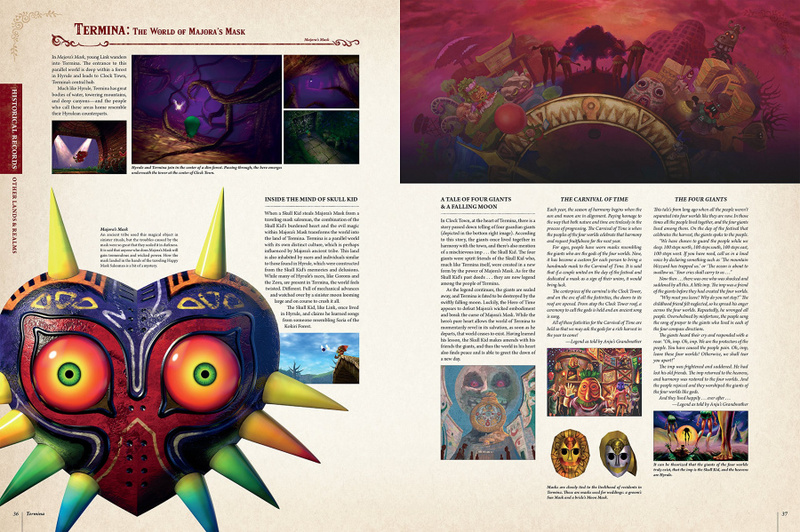 We even went as far to get a dummy version created for Hyrule Historia. We eventually decided not to do a new edition and I was afraid that idea would never see the light of day. When the Encyclopedia became a reality, I pushed hard for the gold cartridge cover and expanded it to include the dust sleeve and instruction booklet. The instruction booklet, by the way, was so much fun to write and for Cary to design. It’s a tongue-in-cheek love letter to the original game which we both love. Cary and I are such huge Zelda fans. Nintendo has quite a big vault. How has it been working with their asset team? Do you make the requests, or do they provide what they are willing to share? We'd love to know how that collaboration works, given how secret Nintendo can often keep their behind-the-scenes stuff. Again, the assets for these were handled by the wonderful people over at Shogakukan and Ambit, but, for something that may be in development for the future, I can say that Nintendo did the organisation and provided the materials that they would like to see in the book. From there, you go back to them and ask for other pieces of art that best show the narrative you are trying to express. There is so much of it that not all of it can possibly fit in one book, so you have to pick representative pieces that give the most insight into the process, tell the story of the game’s creation, or are too stunning to pass up. I believe your books are the first place Nintendo had officially confirmed the Zelda split timeline theory as canon. Can you describe how that came about? The timeline was provided to us, so I do not know the inside story of its development and finalisation. But, boy, that was the most hotly anticipated and debated portions of Hyrule Historia. People still debate aspects of it. I love talking to fans about the timeline. There are some really, really brilliant fan theories out there that connect certain aspects of the game. Here’s a teaser. The Encyclopedia leans into the timeline and elucidates portions of it. The order of at least one of the video games has moved as well, based on some new information. Have you heard any feedback from any of the original featured artists, especially from decades past? I have not, unfortunately. I hope that they like our presentation of their artwork in our books. That’s extremely important to Shogakukan, Ambit, and Dark Horse. We have chosen the highest quality paper for printing and have tried to feature their artwork in the most aesthetically pleasing way that we can. When you’ve got artwork by Takizawa-san, Wada-san, or any of the brilliant artists over at Nintendo, you let it shine. What is unique about The Legend of Zelda Encyclopedia compared to the first two titles? And can you say anything about the upcoming Breath of the Wild title? The Legend of Zelda: Encyclopedia is by far the most content dense. I can’t even tell you how many hours that Cary, Ben Gelinas (our English language writer), and myself put into this book. Every page has hundreds of pieces of information. I can’t tell you how many things I fact checked for this book. I used every resource imaginable. This is less of an 'art book' as it is a straight ahead compendium. It has plenty of art in it, but it’s dense with text as well. 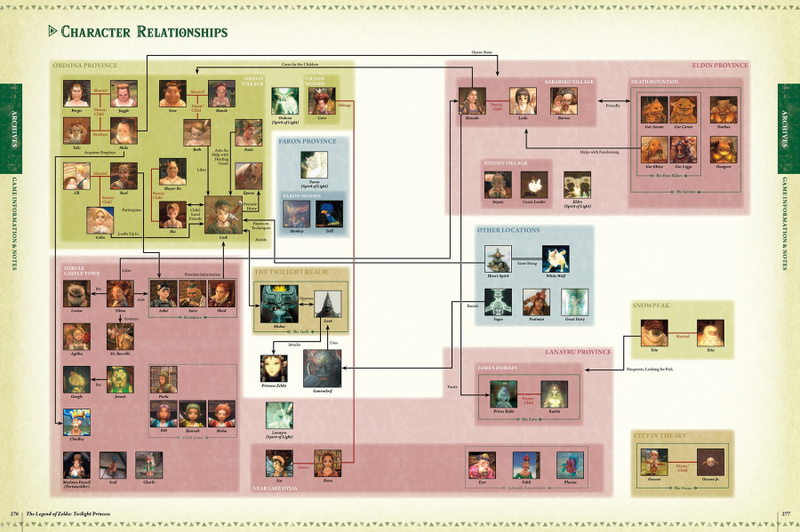 It does things like tracks the Triforce through the timeline, shows the relationships of characters to each other, etc. It also gives answers to questions fans have had for years like, “If the Rito evolved from the Zora, why did that happen in a game where Hyrule is covered in water?” I mean, it would seem counterintuitive that a water-based tribe would evolve in a water-based game like Wind Waker, but the answer is here in the book! The beauty about the first three books is that they complement each other. That’s why I decided to group them into the Goddess Collection and give them the colors of Farore, Din, and Nayru. 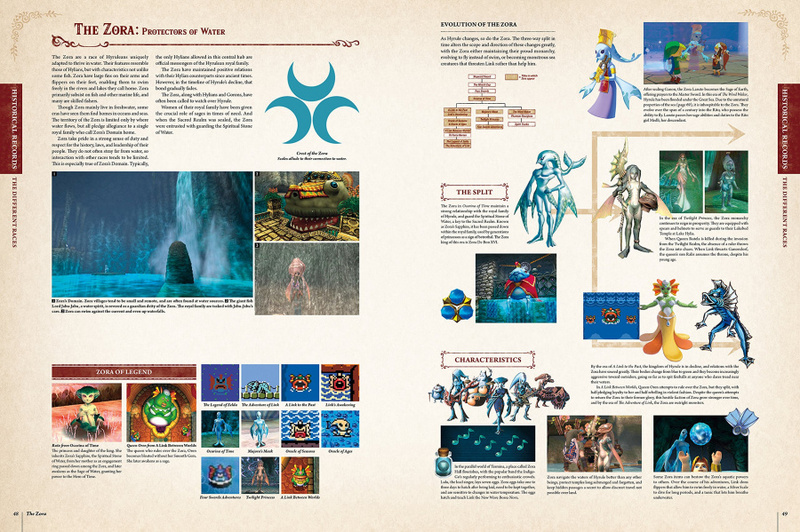 Hyrule Historia gives you the 'making of' portion of the first 25 years of games, Art & Artifacts gives you the art, and Encyclopedia gives you pure in-game information of the first 30 years. 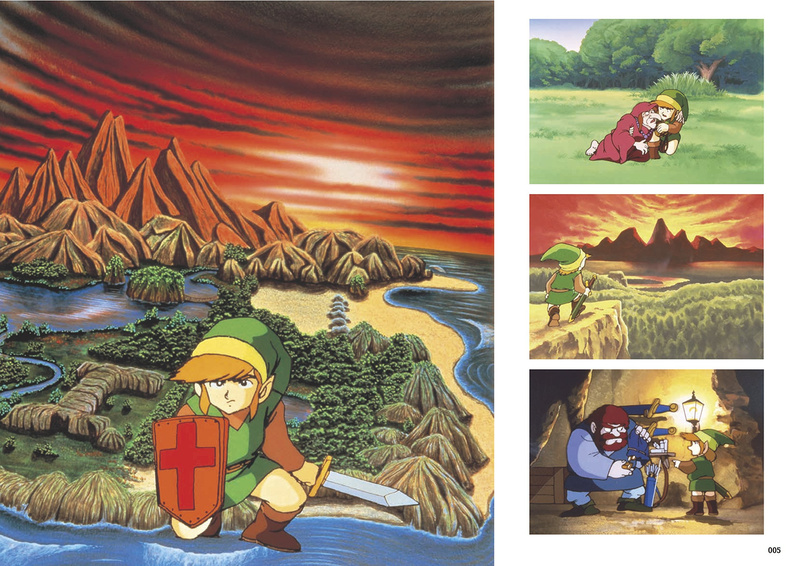 If you have all three, you have a pretty comprehensive look at the first 30 years of Zelda. By the way, it wasn’t by accident that we gave the Encyclopedia Nayru’s blue. She is the Goddess of Wisdom, after all. As for Breath of the Wild: Creating a Champion, so far I can say it is a very art-heavy 'making of' book. It has a huge gallery dedicated to Takumi Wada-san’s illustration, 300 pages of designs, and a 50-page section dedicated to the lore of the game. Finally, so far Dark Horse has published Zelda, Fire Emblem, Splatoon, and an upcoming Mario hardcover book. What can we expect in the future, and it's a special edition Metroid book, isn't it? Ha! I believe that I’m on the record somewhere stating that developing Metroid books would be the ultimate dream project for me, so I appreciate your enthusiasm on that front. As far as what is currently being developed? You can certainly expect more from the Dark Horse/Nintendo partnership. As for what? I guess we’ll just have to wait and see. We'd like to thank Patrick for his time. You can order The Legend of Zelda: Encyclopaedia from Amazon right here. Putting that all together seems like a fun but daunting task. Great interviews guys! My copy of the Encyclopedia just came in a couple of days ago and I have not been able to put it down. 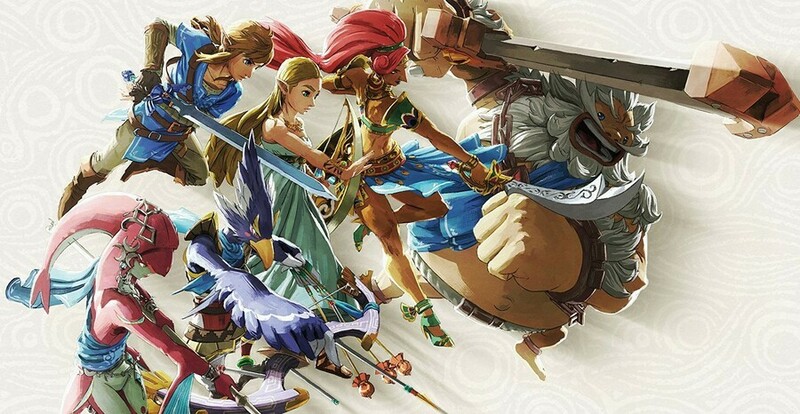 DarkHorse is my all-time favorite comic company (have over 7 art books, Lone Wolf and Cub, Samurai Executioner, and Blade of the Immortal collections) and this partnership with Nintendo has been nothing but awesome. Already got the BotW art book pre-ordered and will do the same for a Metroid book. I would love love love to see DarkHorse hire out folks like Becky Cloonan to do a Legend of Zelda, Metroid, or Star Fox comic book. This partnership is too good to keep on beautiful high-quality art books. These books are a must have for fans they are fantastic, love the collection. Thought this was going to be about the Nintendo comics system till I remembered valiant published those. I love lore/ making-of books. I've got a few others for other game series. Just got Encyclopedia. Looking forward to both Mario Encyclopedia and BotW: Creating a Champion. And man, a Metroid book? I'd take twenty. Yes on the Metroid books! Throw in a translated manga and that's one fine book. I have all three. The new one is the best. I like Historia too, but it conflicts on several pointed with the Encylopedia. The omission of BOTW is a huge gap - no doubt due to the translation schedule. So I look forward to the new book too. Another omission is much about the characters from Hyrule Warriors (like Wizzro: is that his eye or mouth?) even though it's technically non-canon. Great interview guys! Going to be picking these up in August for my sons birthday, can't wait to check them out! Received my gold cartridge version last week. Even though I stopped collecting it all, that design hit me right in my weak spot. Gold cartridge with all the details, slip case, AND a manual? I didn't buy the second book because it was only artwork, and artwork I had seen before. But if the third book is also full of information, I might get it someday!